Publish and Subscribe is an effective way of disseminating information to multiple users. Publish/Subscribe applications can help to enormously simplify the task of getting business messages and transactions to a wide, dynamic and potentially large audience in a timely manner. 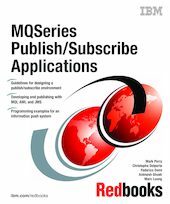 This IBM Redbooks publication positions the MQSeries Publish/Subscribe to MQSeries Integrator Publish/ Subscribe. It will help you create, tailor and configure an application from publishing data through to subscribing via web pages. The books provides a broad understanding of a building and running an entire publish/subscribe solution. It will help give you a quick start to design and create a solution and then migrate it from MQSeries Publish/Subscribe to MQSeries Integrator Publish/Subscribe.